'70s disco music wasn't just Abba or the Studio 54. Just like punk or glam rock were doing at the same time, the "disco" phenomenon generated a plethora of obscure and bizarre studio projects which remained in the unknown, despite being often more inspired and creative than the few ones that reached stardom and sold millions of copies. 45 rpm singles that remained unsold, sitting in junkshops all over the world for decades, hide forgotten gems, revealing genius and avant-garde only guilty of not being at the right place at the right time. 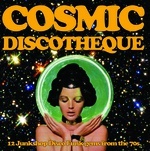 Be it Moroder-oriented proto synth-wave, groovy space-disco or acid Afro funk, the first volume of the Cosmic Discotheque series is all about rediscovering those forgotten treasures while setting your dancefloor on fire. 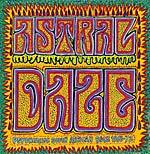 Features The Mystic Moods, Life, Alan Bown, Red Parish Group, André Brasseur, Black Buster, Bil Tze, The People Next Door, Diabolic Man, Performance, Dance Machine, and Pharaoh. Edition of 500.